This started out to be a small project to rework an old Mauser to make a hunting gun. Like all things it turned into a larger project. I decided to clean up the rust a bit and make it look better. I wire brushed it, cleaned it up and lightly sanded to get rid of the nasty stuff and degreased it. I used the last of my Baker’s express for bluing. The formula for Baker’s Express is given in Roy Dunlop’s book Gunsmithing (I think it’s page 391).The chemicals that he lists are all food preservatives and antiseptics. It is now extremely difficult to purchase some of these chemicals, which will be a sad situation if we ever come on hard times in this country and find the need to preserve foods and use simple antiseptics. This is extremely easy to use and just requires a stainless steel vessel and your kitchen stove. It gives a classic rust blue finish and is not caustic. If you are working with silver or lead soldered pieces there are no bad consequences and gives a nice blue finish. “Bluing is a passivation process in which steel is partially protected against rust, and is named after the blue-black appearance of the resulting protective finish. 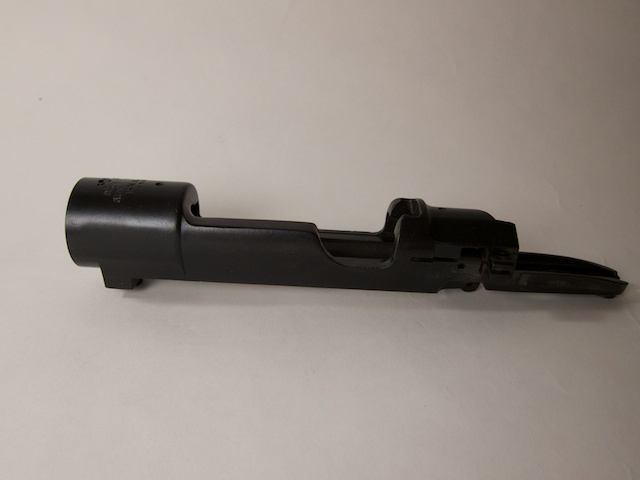 True gun bluing is an electrochemical conversion coating resulting from an oxidizing chemical reaction with iron on the surface selectively forming magnetite (Fe3O4), the black oxide of iron. Black oxide provides minimal protection against corrosion, unless also treated with a water-displacing oil to reduce wetting and galvanic action. In comparison, rust, the red oxide of iron (Fe2O3), undergoes an extremely large volume change upon hydration; as a result, the oxide easily flakes off causing the typical reddish rusting away of iron. “Cold”, “Hot”, “Rust Blue” and “Fume Blue” are oxidizing processes simply referred to as bluing. “Cold” bluing is generally a selenium dioxide based compound that colors steel black, or more often a very dark gray. It is a difficult product to apply evenly, offers minimal protection and is generally best used for small fast repair jobs and touch-ups. The “Hot” process, is an alkali salt solution referred to as “Traditional Caustic Black” that is typically done at an elevated temperature 275°F (135°C) to 310°F (154.44°C) . This method was adopted by larger firearm companies for large scale, more economical bluing. It does provide good rust resistance which is of course improved with the use of oil. “Rust Bluing” and “Fume Bluing” provide the best rust and corrosion resistance as the process continually converts any metal that is capable of rusting into (Fe3O4). Treating with an oiled coating enhances the protection offered by the bluing. This process is also the only process safely used to re-blue vintage shotguns. Many double barreled shotguns are silver brazedtogether and many of the parts are attached by that method also. The higher temperatures of the other processes as well as their caustic nature can weaken the brazed joints and make the gun hazardous to use. Bluing is most commonly used by gun manufacturers, gunsmiths and gun owners to improve the cosmetic appearance of, and provide a measure of corrosion resistance to, their firearms. It was also used by machinists, who protected and beautified tools made for their own use. Bluing also helps to maintain the metal finish by resisting tangential scratching, and also helps to reduce glare to the eyes of the shooter when looking down the barrel of the gun. All blued parts still need to be properly oiled to prevent rust. Bluing, being a chemical conversion coating, is not as robust against wear and corrosion resistance as plated coatings, and is typically no thicker than 2.5 micrometres (0.0001 inches). For this reason, it is considered not to add any appreciable thickness to precisely-machined gun parts. New guns are typically available in blued finish options offered as the least-expensive finish, and this finish is also the least effective at providing rust resistance, relative to other finishes such as Parkerizing or hard chrome plating or nitriding processes like Tenifer. Bluing is also used for providing coloring for steel parts of fine clocks and other fine metalwork. Bluing is often a hobbyist endeavor, and there are many methods of bluing, and continuing debates about the relative efficacy of each method. This entry was posted in Rifle Building and tagged Machining, Metalworking. Bookmark the permalink.